I am passionate about a lot of things. Food, fashion, family and film are all consuming pleasures of mine. But there is something I'm equally fanatical about which might seem somewhat unexpected. I love words. Language, jargon, definitions - I find all of these simply fascinating, and have for as long as I can remember. Back in school, in Linguistics and Latin classes, lectures on morphology and derivatives were red letter days on the calendar. Yes, I know. I'm a geek. But I cannot help myself. I adore nuanced meanings, the way that one right word can say so much more than paragraphs and paragraphs of the wrong ones. A well-chosen phrase can be a study in succinct economy or art itself. Mellifluous is as poetic as its definition. While lush is lovely, verdant is all the more exuberant in its profusion. Lately though, one word has been (excuse the pun) on our lips most often - surfeit. With the local trees and fields heavy with fruit, the early summer harvests of berries, currants, sweet peas and cherries are gracing our table. Truly nothing less than luxuriant abundance, we're most often seen feasting on this bounty of beautiful produce out of hand. However, when recently bestowed with not one, not two, but three baskets of garnet-hued cherries, I felt the little jewels deserved a bed of buttery cake to fully appreciate their depth and colour. Sweet and plump, the gorgeous orbs almost melt, turning luscious and silky while staining the almond-rich batter with their juices. One taste, and even words aren't necessary - just enjoy. Preheat oven to 350°F (175°C). Generously butter a 10" springform pan, and set aside (see note). In the bowl of a stand mixer with the paddle attachment, or with a hand beater, cream together the butter and sugar until light and fluffy. Lower the speed and add the eggs, one at a time, beating until fully incorporated. Scrape down the sides of the bowl as needed. In a small bowl, combine the sour cream, vanilla extract and lemon zest. In another bowl, sift together the almonds, flour, baking powder and salt. Add half the flour to the butter mixture, beating until blended. Add the sour cream mixture, beating again and scraping down the sides of the bowl. Finish with the remaining flour and stir until just combined. Spread the batter evenly in the prepared pan. Sprinkle over the cut cherries, the almonds and the Demerara sugar (if using). Bake for approximately 40 minutes, or until lightly golden and a cake tester comes out clean. • For the photograph, I used two 11"x8"x1" removable bottom tart pans. The cakes took about 30 minutes to bake. 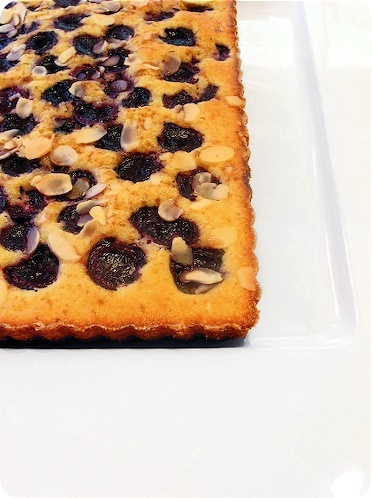 • Alternatively, lightly toast the almonds in a dry pan before topping the tart. • Other fruits, plums and apricots for example, can be substituted.